Winning the Brother/ Stationery News Reseller of the Year awards is expected to generate kudos among customers, but staff also get a real kick from the industry endorsement. 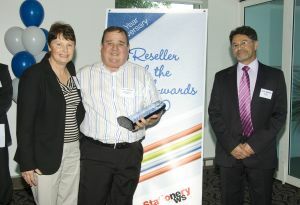 Congratulations to the 2011 Brother/ Stationery News Reseller of the Year Awards, revealed here for the first time. A collection of images from this years Brother Stationery News Reseller of the Year Awards presentation ceremony at the Cruising Yacht Club of Australia. Members of the office products community descended on Sydney from around the country to celebrate the 2010 Stationery News Reseller of the Year awards. 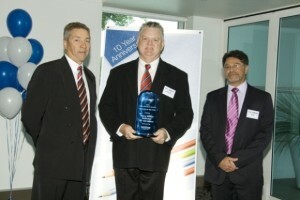 Office National dealers take home awards With the largest program in its 10-year history, the 2010 Stationery News Reseller of the Year awards have been announced, with Sydney and Adelaide-based businesses taking out this year’s prizes. The total package The past 12 months have been busy for Vince Davoli and his team at Total Office National in Victoria. After making their awards debut last year, they are back again and looking for a better finish. Not so foolish When Chris Hoban and Terry Murphy decided to open a stationery business together, little did they know that some 26 years later they would still be selling stationery. Hunting in the Hunter At the turn of the century Stuart and Dunn was with a different group, had different owners and was winning awards. After the first decade it has new owners, is part of a new group, but is still winning awards. Defending the title Stationery Wholesalers was no doubt a deserving winner in 2009, but can it back up last year’s performance to take out its third Reseller of the Year award? South Eastern head north After missing out on a trophy for the first time since they competed for the awards last year, South Eastern Office Supplies are looking to get back to their winning ways in 2010. West is best West Australian reseller Quick Corporate Australia has been busy over the last 12 months, not just in WA and South Australia, but in Queensland, where an acquisition has seen it grow even bigger. Movin' on up After taking out the Reseller of the Year title five times in the Under $5 million category, Adelaide Direct Stationers has stepped up in class and are ready to take the big boys head on. Bahnstorming The transformation that The Paper Bahn Office National has made in last two years is quite amazing. The business has gone from strength to strength and it has been a long time coming, according to owner Barry Paterson. Nu Year, Nu business The past 12 months have been nothing short of amazing for Nu-Print Office Choice in Melbourne. The business is in a massive growth phase and it has all come down to one thing: hard work. Hooray for Humphreys There are not many businesses with a reputation like that of Humphreys in the local community. This reputation has been forged over many years, and the locals are very happy with their offering.